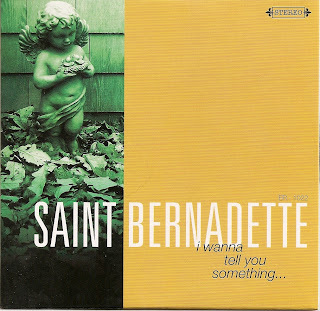 After a three week hiatus, The Sunday Spotlight it back, this time with a MISB favorite from last year, Saint Bernadette., who released their debut album In the Ballroom in October (read about it here). Instead of recording in the ballroom this time though, the pair has chose a more traditional studio located in the same town to put together the five tracks on the EP. The first track (In Between) feels like it could be a track that was dropped from the album. It's got that smooth jazzy sound to it that was such an attraction with In the Ballroom. The three middle tracks (including Love Is a Stranger - the focus of this post) have a larger, fuller feel to them that make them feel like a newer sound for the pair. The title track, which closes the EP, slows things down with a romantic invitation to that someone special that draws the EP to a close quite nicely. This was a very interesting song, the way it came about. And it’s kind of a sad song, really. Keith brought it to me and he had just the melody for it and the one line "love is a stranger". He thought it was just a placeholder lyric and was really singing it more for the rhythm and how it sat with the melody. But I just thought it was heartbreaking. I was hoping it wasn’t some subliminal message directed at me! It immediately made me think of when a person has sort of compartmentalized all their emotions. We all know people like this and we all have been like this at one time or another. After your heart has been broken, when you really just don't want to feel anything, not even anything good. You’re just kind of walking around like a zombie waiting for something to snap you out of it. The verse is about a person who has always given his life for other people. Someone who compromised his own wants and dreams to remain safe and reasonable. I can’t remember exactly why we both started to sing the verses together, but I think it’s really cool. Keith actually has a great voice as well. He could easily be the lead singer, but there’s just only so many jobs one person can do in one band. He could really play any role in the band, but the guitar spot is kind of the de-facto conductor so that’s what he does. Once we started recording the song and had a first mix done, Chris Sanchez, our producer, told us just to go for it with respect to the backing vocals. We were going for Journey and I think we came pretty close. We just wanted this to be a big ole, epic rock song. I wrote the verse lick first, playing around with the guitar part. In my mind I could hear my brother doing those tom tom crescendos. It’s the kind of part that every drummer wants to play. The 2nd part that came is the chorus. I came up with the chords and the melody line and started singing “love is a stranger” to it. At that point, I brought it to Meredith and asked her to sing something like the idea that I had but she thought that the idea was already right. But we knew we needed a bridge between the verse and the chorus and that’s when we came up with the pre-chorus section, which has become my favorite part of the record. These kind of joint ventures have always resulted in our strongest material. We’ve written some really hot songs in this manner. 1.) The EP has a different feel to it: less jazzy and more, i dunno...bigger (at least in the middle 3 tracks). Part of that I can imagine is the setting it was recorded in, but where do you see yourselves going with the next LP (or are you not thinking that far ahead yet)? Meredith - We have two new projects already in the works. The first is called Great Men of Cinema which will be odes to great male film characters like Julian Kaye from American Gigolo, Damone from Fast Times at Ridgemont High, Axel Foley from Beverly Hills Cop. We’re thinking of doing a more synthesized sound for that with programming, so that we can make it at home. Then we are working with an amazing, amazing, writer named Geremy Jasper (frontman from The Fever). He wrote some Dusty Springfield, Memphis soul style stuff for me to sing. We just recorded the first one and are really excited about it. Keith - Yup, this record was recorded in some pretty ghetto-fabulous Bridgeport studios, and the band played HARD. You can taste the asbestos. I'd like to get back to some of our other influences for our next one. Maybe more of our country and hip hop sides...Blue Crunk, if you will. In the meantime, we've just released a side-project called The Priestess & the Fool, which is a collaboration between various members of our label's roster (Exotic Recordings). It features Meredith and Brian Grosz (Dogs of Winter) singing together. There are 6 songs on the EP, all of them duets from the past and present taken into entirely different directions than their original styles. That was a fun record to make! 2.) Working with band members and creating music, while clearly offering more possibilities for growth and evolution, can also be full of concessions and negotiations. Being a MARRIED couple of musicians, now that sounds like it could be a challenge! How do the two of you approach making music with each other? We’ve written every way you can imagine. Sometimes Keith comes to me with a chord progression. Sometimes I come to him with a melody and lyrics. Sometimes we just get on random instruments and record ourselves for an hour or so and then pick out the hot grooves and build on those. There’s very little negotiation, honestly. I had a friend in a band a while back who said that whoever comes up with the “seed” of the song has the final word, and we basically work like that. If Keith comes with the idea and says, oh we need a pre chorus or another section here, then I write it. If I come to him and tell him I want a different approach to the guitar part, he does it. Everyone in the band then contributes their ideas for their parts, for drops, or little ornamental things. We’re very lucky that Kevin, Joe and Brandy are all great, great musicians and have so much to contribute. Well, because of our relationship and how well we understand one another we get to the point quickly. Since time is money in the studio it's really helpful to have someone there who's got your back if you're having trouble articulating your ideas. 3.) Who would be your favorite (other) married artists: Captain & Tennille, Sonny & Cher, Mates of State, or some other? 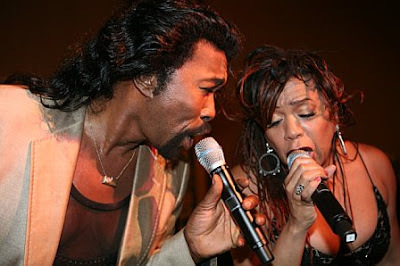 Well, you might not know this, but Ashford & Simpson performed at our wedding in May. It was a surprise gift from my mother. [check out the pic below!]. They are so incredibly nice and such cool people. Now, they are absolutely our favorite married songwriting team. And they told us our marriage was “solid as a rock”. The Simple Pleasure, Deathkiller, Stephanie's ID...there are a bunch of good teams out there. The EP comes out in just a few days on March 4th. You're sure not to be disappointed if you enjoyed their album last year. Visit their website, their label Exotic Recordings, and become their friend on MySpace.